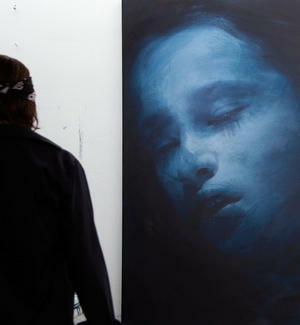 Gottfried Helnwein is an artist of clear statements, uninhibited and idiosyncratic. With his hyper-realistic depictions of tortured girls in the 1970s to the paintings and photographs of today, he confronts us with the dark sides of human nature. Silently but mercilessly he uses the fate of the innocent child to bring before our eyes the human capacity for suffering, making the beholder a passive, and indeed active, accomplice to injury and abuse. It is not for nothing that Helnwein is one of the world's best-known and at the same time most controversial German-speaking artists of the post-war period. Helnwein is an artist who thinks in political terms, analysing present and historical world events and revealing, there too, the structures of power and violence. All his life he has addressed the issue of the cruel mechanisms of the Nazi period. His pictures are an ongoing appeal against collective amnesia, deliberate or otherwise.